A Spanish MD-83 passenger plane suffered a wing tip strike upon landing at Kandahar, Afghanistan. The crew flew an RNAV approach for which the operator lacked authorization and continued to land even when the approach became unstabilized. The Spanish accident investigation agency CIAIAC published the final report of their investigation into the causes of an accident involving a McDonnell Douglas MD-83 on January 24, 2012 at Kandahar, Afghanistan. The airplane was operated by Swiftair, a Spanish airline, under an ACMI arrangement with Gryphon Airlines. Flight SWT094 departed Dubai Airport (DXB) at 06:08 local time on a scheduled service to Kandahar with the first officer as pilot flying. On board were 86 passengers and five crew members. The en route part of the flight was uneventful. Kandahar approach cleared them for an RNAV (GPS) approach to runway 05. Wind was reported from 060° at 17 kt gusting to 24 kt, visibility 1200 m, scattered clouds at 2700 ft and broken clouds at 3000 ft, temperature 1°C, dewpoint -7°C and QNH 1018 mbar. The target speed associated with a landing weight of 136,000 lbs was estimated at 140 KIAS (Vref 135 +5). At a radio altitude of 1000 feet the airplane was fully configured for landing with flaps 40 and landing gear down. The heading was within margins but the speed was 192 kts. It should have been between Vref (135 knots) and Vref+20 (155 knots). Also, the airplane was above the theoretical glide slope. It was also descending at a rate well in excess of 1000 ft/min. The approach was not stabilized at this point. Since the captain had more operational experience at the Kandahar, he decided to take over the controls and fly the last phase of the approach. The PAPI was out of service, meaning they only had visual references to the runway and above the ground during the final part of the approach. During short final the captain corrected a deviation from the runway centerline by adjusting the flight path from right to left. 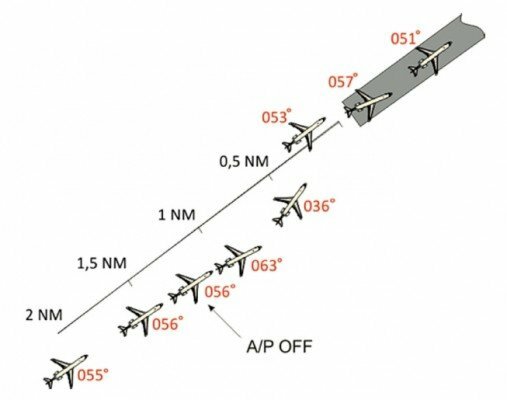 During the flare, the crew noticed the airplane was shifting to the left, threatening to take them off the runway, as a result of which the captain applied a +20° right bank angle at a +9° pitch angle. This caused the right wing tip to strike the ground before the wheels made contact with the ground. Touchdown speed was 122 knots, which was below Vref as well as the target speed . The captain regarded the maneuver as a hard landing, although the first officer thought they might have struck the runway. On exiting the runway, the airport control tower ordered the crew to stop and informed them of the damage they experienced. The wing had contacted the ground some 20 m prior to the threshold, resulting in five threshold lights being destroyed by the aircraft. CIAIAC concluded that the accident was “likely caused by the failure to observe the company’s operating procedures and not executing a go-around when the approach was clearly not stabilized. Moreover, the operator lacked the authorization (and the crew the training) to carry out the RNAV (GPS) approach maneuver that was conducted at RWY 05 of the Kandahar Airport.” Contributing to the accident was the inoperable status of the PAPI at runway 05 of the Kandahar Airport, which was thus unable to aid the crew to establish the aircraft on the correct descent slope.